Silverpoint drawing dates from the 14th century throughout the 16th and the Renaissance era. It became the medium of choice, and a well established technique, before the availability of graphite, conte crayton, and natural chalks. Any metal in wire form can be used to make drawings: copper, gold, platinum, bronze, or silver. Silverpoint is, in fact, a specific type of metalpoint drawing, and it was certainly the most popular and widely used. It produces the most delicate of lines of all the metals. 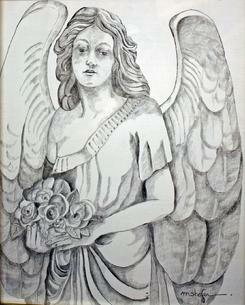 Many "Old Masters" worked in silverpoint. Raphael used silverpoint in his studies, as did Holbein, Rembrandt and Rubens. Leonardo da Vinci used silverpoint extensively and there are numerous drawings of his existence. The technique of metalpoint involves dragging a stylus of metal across a substrate prepared with a slightly abrasive surface coating, or ground. As the metal is drawn along the surface, tiny particles of metal are left behind, creating a mark. Although it is quite difficult to use, metalpoint produces a particularly fine and delicate mark, making it a desirable tool or the highly skilled draftsman. The characterisitcs of silverpoint are subtlety of tone in the lighter end of the tonal scale with single-hatch drawing resulting in an extremely uniform, sensuous surface. It is the most unforgiving of mediums with no erasures or 'do overs'. Depth of tone and shaded areas are created painstakingly with numerous, fine lines laid on top of one another. The initial marks of silverpint appear grey as other metalpoints, but silberpoint lines, when exposed to air, oxidize and tarnish to a warm brown tone. The oxidation becomes perceptible over a period of several months or years depending on exposure. Although silverpoint is no longer a well-known drawing medium, a small contingent of artists has continued to use it to create increddibly delicate and ethereal images. 20th century metalpoint artists include Otto Dix, Paul Cadmus, and Pablo Picasso. These Modern artists, who had a wide range of drawing media to choose from, deliberately chose metalpoint for the fine detail and precision that is unattainable though other media. Silverpont is an intriguing, though often forgotten, art form that holds an important place in the history of art. 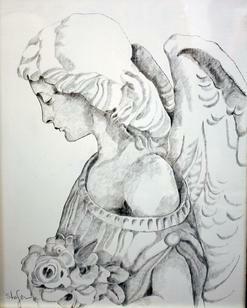 Its unique aesthetic qualities and challenging technical requirements make it a highly respected and cherished drawing medium. The medium remains exacting yet very rewarding as somehow, as an artist, one feels "connected" to the work of centuries ago. 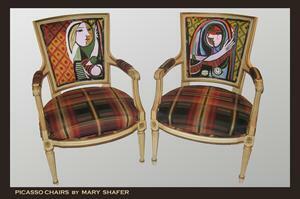 A Mary Shafer chair or settee will make your home memorable with a stunning adaptation of a grand master. 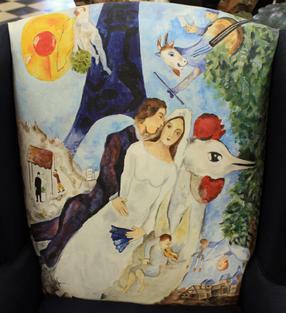 Contact Mary Martin at 843-723-0303 to discuss the fabric paint and its astonishing durability as well as the process of adding a piece to your decor. Spectacular! Beautifully used in two different rooms. 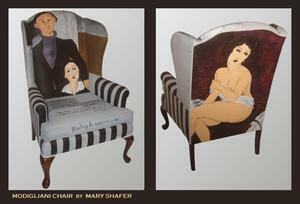 Procedure for ordering hand painted chair panels. 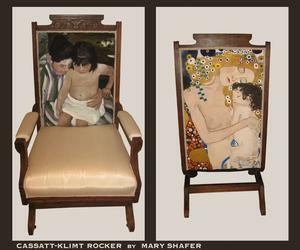 Mary Shafer has created a fantastic product with her fabric painting. 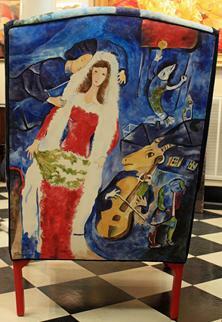 Mary Martin features the Master's paintings although any scene can be ordered. 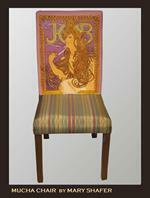 She can take any settee, chair, or swath of fabric and paint almost any scene upon it. the paintings are permanent and can resist multiple bleachings (she has tested almost any type of cleaning products). If desired, she can place new springs in cushions, upholster, paint something of your choice, even your favorite photo or scene onto your furniture. A more cost effective way for interior designers from outside the Tri-state area to work is to send the desired fabric (with consultation with Mary Shafer as very nappy fabric may not be desirable) to Mary. 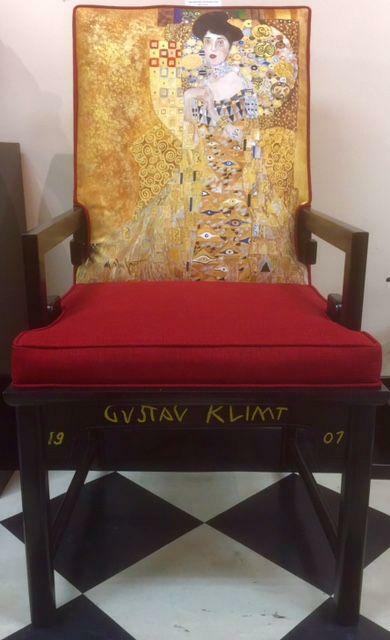 The fabric is painted and returned to the designer who then upholsters the furniture. 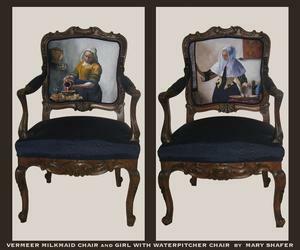 Visit the Mary Martin Gallery to see actual samples of the work, review the permanence of the paint upon fabric samples, and to place an order. 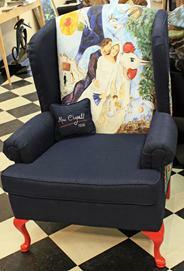 If ordering long distance, send photos of the chair, a sample of the fabric, a photo of the desired painting plus measurements of the surfaces to be painted for a quote. 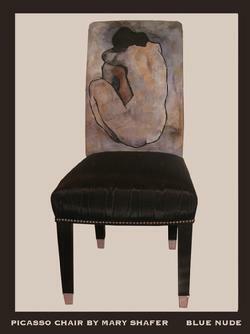 Any fabric surface can be painted including arms and backs of chairs.